Brick driveways are sometimes installed using mortar to adhere the individual bricks together. A mortar installation can accomplish a smoother, cleaner look as the spaces between the bricks are of a uniform color, texture and finish. Mortar installations can be a bit more expensive, however, and because of the brittleness of the set mortar they can detract from the flexibility and durability of a standard, sand based installation. 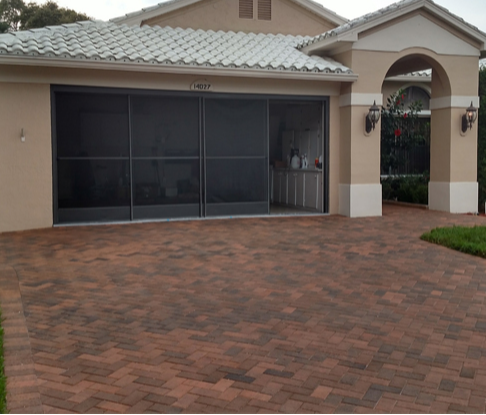 The sand based installation technique of driveway brick pavers is a key component of their acclaimed strength and durability. While some people prefer the finished look of mortar to the more rustic appeal of a sand installation, a sand base is far more flexible and durable because it shifts and settles with climate changes. The ability of sand to expand and contract in reaction to the weather takes the pressure and friction off of the bricks themselves, allowing them to stay in great condition for decades. Whether you choose to go with a sand or mortar installation, it's likely that your brick driveway will need to be installed on a new foundation of crushed rock and sand. The depth of this foundation will vary a little depending on the type and quality of your property's soil, but generally you can expect to need about an eight inch foundation.